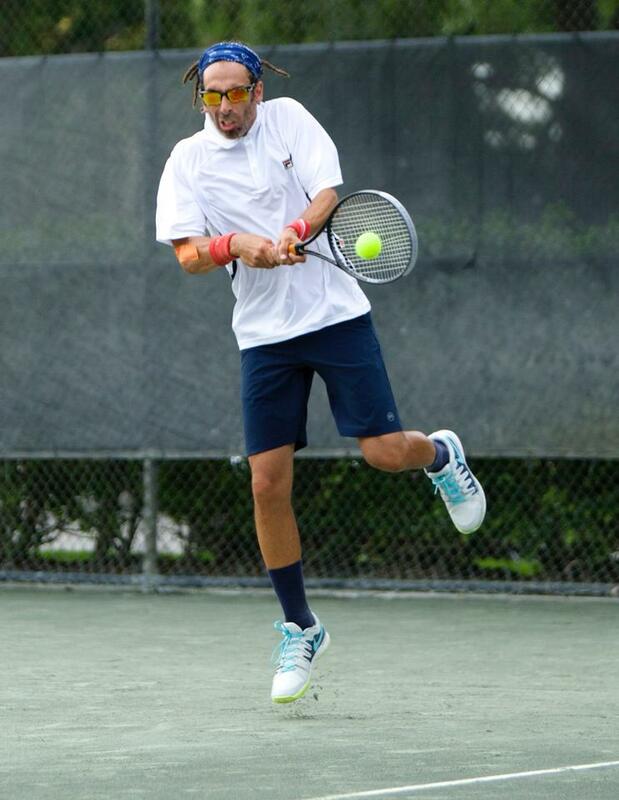 Jared Jacobs is a tennis player from Scottsdale, Ariz. who finished 2013 ranked No. 2 in the country in Men's 35 singles. 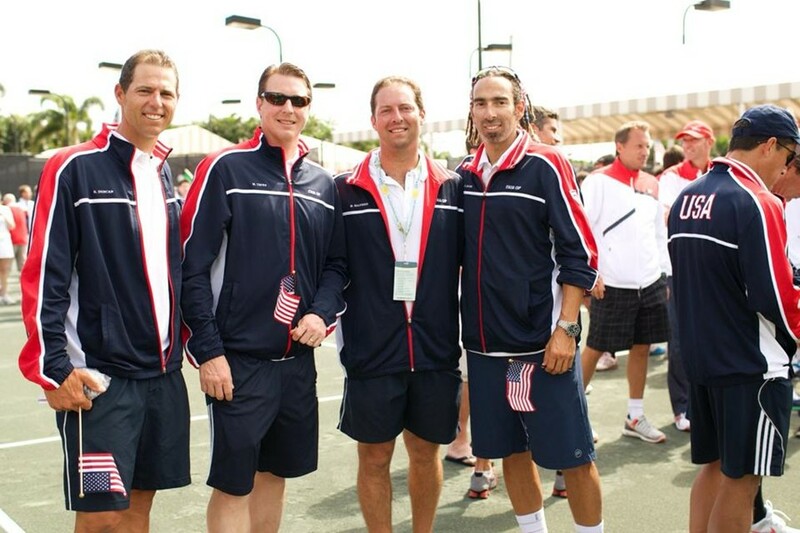 Jared's stellar play in adult age group events in 2013 allowed him to be chosen as one of four men to represent the United States' Men's 35 team competing in Boca Raton, Florida this coming week at one of the most prestigious international competitions in the world, the ITF World Senior Team Championships. Jared and Andy Stoner (Cave Creek, Ariz. - Men's 50s) were both players from the Southwest that were chosen for these select national teams. Jared’s teammates will be Stuart (Ross) Duncan (Laguna Beach, Calif.), Michael Halperin (Boca Raton, Fla.) and team captain Mark Tepes (Medford, N.J.). The trip will be something of a family reunion for Jared, whose mother and father both live in Florida, and his first-ever chance to compete for the United States. 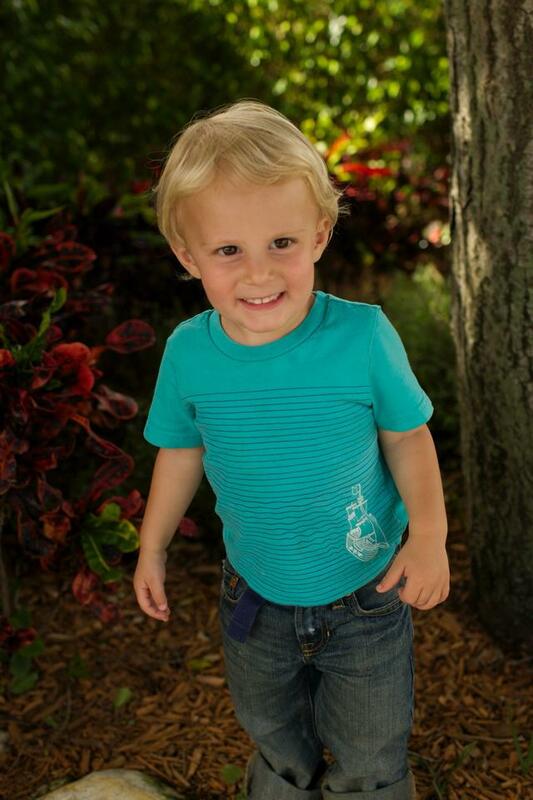 Jared is also bringing his young son Otis (Mojo) along for the trip this week. 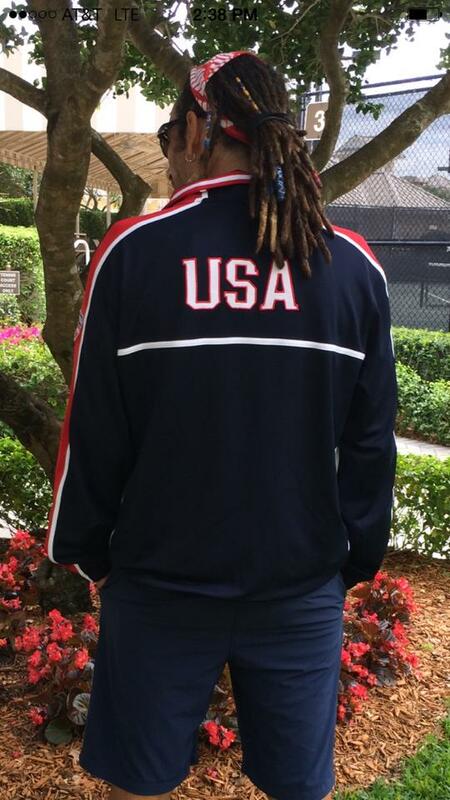 Jared will be blogging to us back here in the Southwest from Florida during the tournament, giving us a report of things on the grounds and what it's like to be a part of the national team. One other Southwest guy. Let's wish Jared well as he not only represents us here as a Southwest player but as an American, and hope for tons of great adventures both on and off the court. I just dropped Mojo off with my parents so for the first time since getting here, I actually have a moment to think about the event before I go hit the practice courts. I noticed for the first time all the big tennis bags around the lobby. Huge bags loaded with racquets and clothes now all over. Getting here yesterday, it seemed like a rather empty lobby. That’s changed. I'm going to go meet my teammate Michael Halperin for a light hit today before our first official team practice this afternoon. I had hoped to get in a practice yesterday as well but without a babysitter it wasn't possible. These days that happens from time to time. I don't always get to hit when, or as long as I want, but being with mojo all the time has definitely helped teach me to get the most out of the time I do have. More later after team practice. (Here’s a story on Michael Halperin today on the local news. Michael’s from Boca, so this is a nice little local piece). One thing I’m noticing again is the humidity. I’ve lived in Florida quite a bit, but it’s bonkers here compared to Arizona. I’ve sweated more walking to the car than I do in two hours of playing back at home. Today (Sunday) is the opening ceremonies and start of the games. We had a team practice this morning that was myself, Michael, Mark, and Ross. It being Easter morning I was left without anyone to watch Mojo again, so I brought him to the courts today. I just was not sure if I would actually get in any practice. I got there, set him up at a table next to our court with a few books and toys and some juice. Took out my racquet and headed to warm up. Mark and Ross both turned to me and asked, “Is he gonna stay there and let you play? Well find out soon enough,” I said. As if Mojo had a sense of the moment, he was amazing. He watched and played not disturbing at all except to occasionally run out on the court and fetch a missed ball in the net and throw it back to one of us. And, of course, I had to promise to let him hit balls when we were all done. 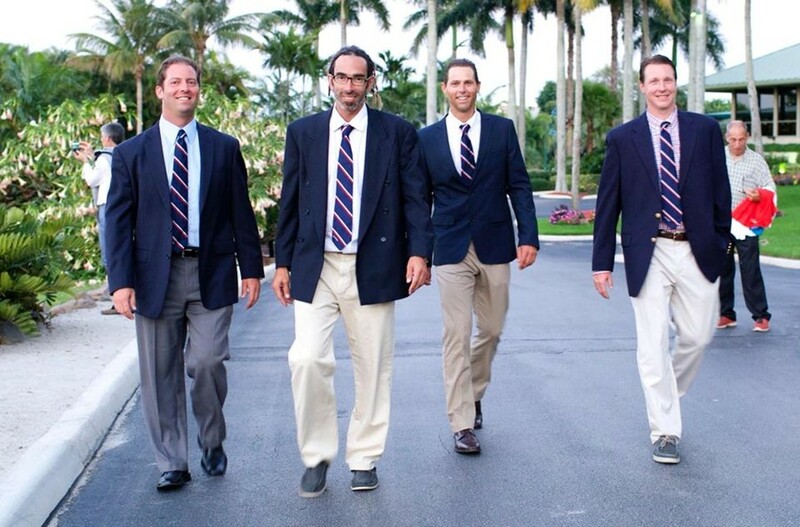 After practice we all went back to our places to shower and change for opening ceremonies, which were held and the beautiful Boca Raton Polo Club. When I arrived, I started to see hordes of people all wearing their countries uniforms. Apart from Mongolia, who only had 3 members on their team, most countries have 20 or more players and are represented in just about every age division. We all lined up and marched on to center court behind our flag and stood for the national anthem. This was the first time I've ever had to stand for the national anthem in an event that I was actually a part of, and I could see my parents and other players’ families all taking pictures. Cameras and phones and photos were being taken from all over the place. After the national anthem, we were invited to the amazing spread of food and drinks put out by the Polo Club. We all stayed as a team for a bit and met each other's families. But it was short and quick because Ross wanted another practice, and I was more than happy to oblige. And what we intended on being a light practice turned into an epic baseline game war with long points and heavy hitting. I'm feeling really good about our team and the roles and position everyone is filling. 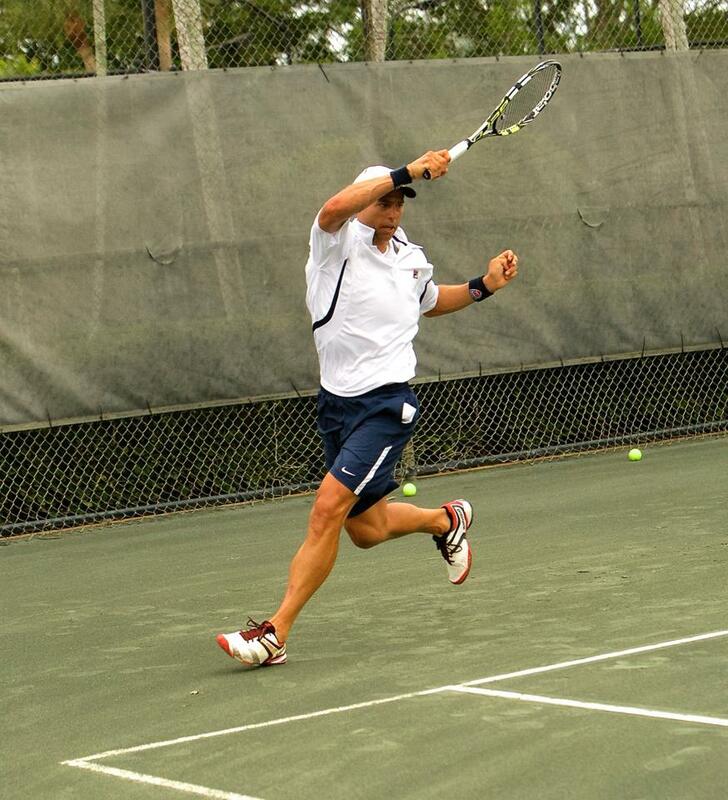 Michael is a huge hitter and when he is on his serve is unreturnable. Ross is one of the toughest competitors I've ever seen, and playing two for us is sure to give everyone he plays trouble. 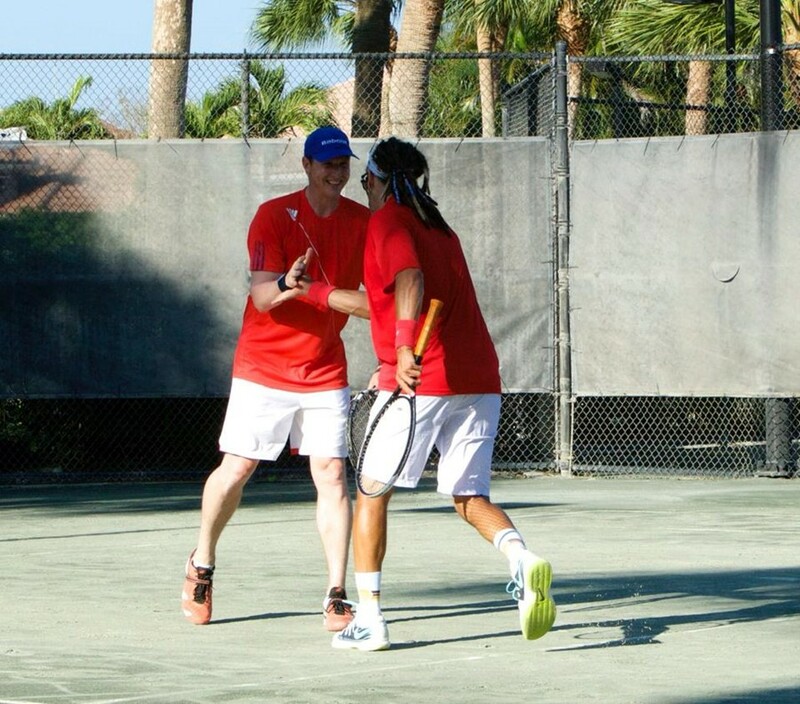 And Mark and myself I think will make a great doubles team. We have spoken a lot about how we like to play and were definitely on the same page. We might not have the highest ranked guys here. Switzerland has two guys that were once ranked in the top 40 in the world in the ATP Rankigns, and they are only a 3 seed. But I think we have a great mix of guys and I can't wait to get this started. We are in a group with Australia and Turkey, and we are the fifth seed. So a group win would be awesome. Australia and Turkey play each other first, so we will have another day of practice tomorrow and then a little scouting since we're on a bye to start. I'll catch up with you guys tomorrow. Go USA! First day of competition today at the Boca Grove Racquet Club, and after a good team practice this morning, we went over to watch some of the Australia vs. Turkey match. These are the two teams we will end up playing this week. We got the bye today, so we got to watch and study our future opponents. It was hard to tell if Australia was that good or Turkey was that jet- lagged, but all three matches, including the two singles, a doubles and warm-up and breaks in between lasted a grand total of 3 1/2 hours. Australia won all three. Not everything went so quickly today, though. After watching Turkey-Australia I left to have relax, change, shower, eat, and then get in another 90 minute hit with my teammate Ross Duncan. By the way, it's become clear early that we need to travel with an additional team of sparring partners for him. We could just rotate guys in with him all day. Let him play his match, and then he's going to want to know who is up for an evening hit. Incredible!). Anyway, when we were done with our hit and leaving the club, we realized Costa Rica versus Portugal were still going and on court! A match that started at 11:30a.m. was only in the first set of their doubles match, and it was just about evening time. They were still on late, probably due to the four-hour battle between one of the loudest grunting, most accomplished pushers I have ever seen. Talk about a contrast of style. The guy from Costa Rica murdered every ball and the guy from Portugal would grunt like Sharapova and Azarenka at the top of their lungs combined, but the ball would just float back. I mean some of the floaters he hit were really slow, they made Gabriela Sabatini’s second serve look like John Isner’s. All in all though, the quality was high. The teams all look good. Some are definitely tougher than others. We had some pretty high-profile visitors at the site today, a couple of players who know a thing or two about representing the United States. 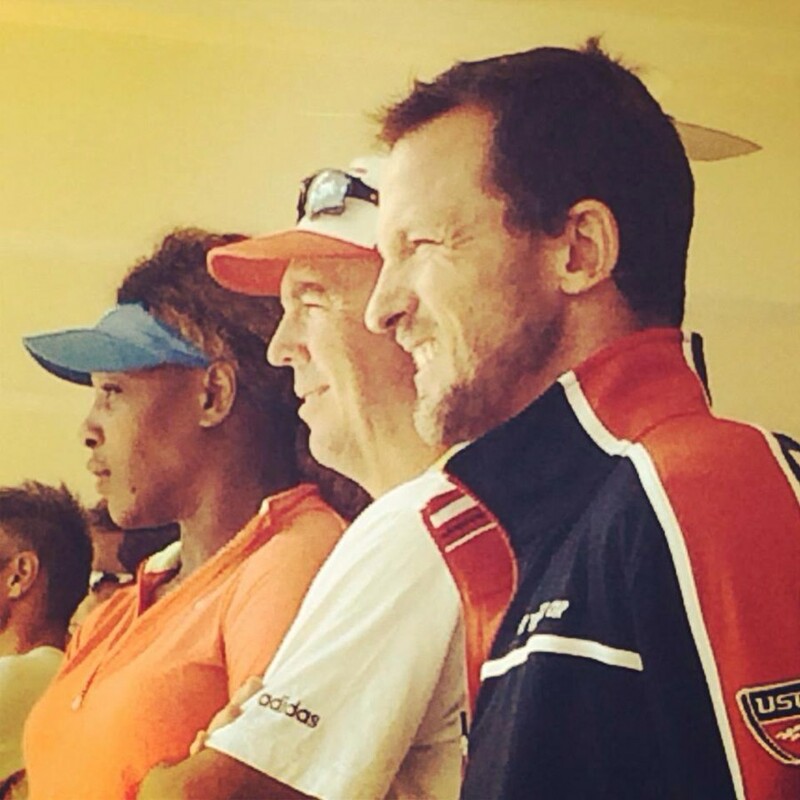 Serena and Venus Williams stopped by and took in some of the action, which was really cool. They live not too far from the club and were out practicing together, so it was great to see them stop by our site and watch. I took a grainy picture, but you can clearly see it's Serena! Tonight, we just had a fun dinner with family and friends, and I suspect we consumed enough carbs to get us through the week. Australia tomorrow, Court 5! Let's do it USA! Okay, so yesterday when I said Ross Duncan was a tough competitor, I wasn't messing around. Match of the day goes to him today, as his singles victory in our match today against Australia was a total war . At 2-1 in the first set, France and Canada were on the next court had already finished their first set. By 6-5 in the first set France and Canada were done, court was swept and match 2 was starting. Ross's opponents from Australia served for the first set up 5-4 30-0, and looked for the world to win the set. Ross came back, got it to a tiebreaker, and went up 6-4. Then again 7-6. The Aussie guy just would not miss. Ever. I think he made 3 unforced errors in the whole match. Then Australia had 3 set points in a row and Ross saved them all. Finally on the 6th or 7th chance (I kind of stopped counting) Ross (pictured, above) finally converted taking to win an amazing first set in a 13-11 tiebreaker. There was a huge crowd cheering for every point. These guys were having so many 30-40 ball rallies, it was crazy, so the second set became like another battle in this war. Over three hours later and Ross put the team in good shape with a straight-set battle. Yes, you read that correctly - three hours, straight sets. Next up was Michael Halperin, our hometown guy here on this US team. Every time Michael missed a serve into the net, it sounded like the net posts were coming out of the ground. The guy just kills it. France and Canada's guys kept turning around talking about the sound his serve makes when he hits it, so you know it's a bomb. Michael really never let the Australian player into his singles match today, and won 6/3,6/2, which clinched the team victory for us. Next up were Mark Tepes and I in the doubles. Because Ross did such a good job wearing out their #2, that we were going up against their #1 singles with their first doubles player. I think we came out a bit tight, but served for the first set at 5/4 only to get broken. It's okay, we broke them right back and served it out for a 7-5 first set win. The second set was again tight the whole way. No breaks at all until 6/5, when we dropped serve and lost the second, forcing a third-set and this long day to get even longer. So we were now the last team still playing on court. All the other team matches were completed, so it was just us out there. Mark and I had both played well occasionally in this match, but never really at the same time. We finally put it together for a sustained time in the third set, and with all our kids and family cheering on the sidelines, we played the way I know we can, and took the third set 6-1, sweeping Australia 3-0. Now it's time for a big dinner and an early night so we can come back and do it again tomorrow against Turkey. Go team USA! Hit you guys up tomorrow. So it's the 4th day of the competition and we all seem to feel a little bit better each day. Team USA has found a groove. We know where we eat breakfast, who rides with who to the courts, who we warm up with an for how long. There are some little quirks that started off unintentional, but now have become part of the ritual. For instance the hotel I'm at has free cookies in the lobby, and every time I bring Otis to the courts he grabs one. Then when I go to put him in the car seat I take the cookie and put it on the roof of the car. Invariably I find it there on the next trip. It didn't start on purpose but now we bring one cookie for Otis and one for the roof. Had a big dinner last night where the whole team got dressed up. Felt like the first time I'd been that dressed up since high school, but our team looked sharp. We have advanced out of our group, and are playing today against Great Britain. This is kind of what it must feel like for the pros who make the second week of the Grand Slams, just the big boys left now. Been busy the last few hours, so will try to blog more later. Tough day. We lost 2-1 to Great Britain in the quarterfinals and I'll tell you guys more later. We're all pretty tired. It was a rough loss. We lost both of our singles matches, and Mark and I won 7-5 in the third in doubles. We had some great support today. All of our families were out cheering today, so that was really nice. We have a bye tomorrow. The team is going to barbeque and probably practice in the morning and get ready for Germany, who lost to Switzerland. So today was another bye day for us. We play Germany for 5th or 6th tomorrow. At least we think we play Germany. We didn't watch today or check the results. I went out this morning with mark and hit a few balls with both he and his daughter. I gave her some tips and played some games to try and make her have some fun around the game. She's a future college star so keep and I out for Samantha (aka Sammy) Tepes. While I was doing this, Sammy was teaching my little boy (Mojo) how to swing a racquet horizontally, a task I have not yet figured out, but with some determination she totally did it! Anyway, after our early morning hit, the Tepes' hit the beach and the other guys got in some practice. I just got in some rest. Then we all met for dinner at Michael's house where his wife prepared salmon cooked in the dishwasher (seriously, the dishwasher and yes it was excellent) along with probably the best tasting quinoa I have ever had. She said the trick was boiling it in chicken stock. Good to know. Ha. I'm sure you guys love that! Anyway, then the guys hung out for a bit. I strung up a few racquets and we decided we liked our team enough we might stay together and make a run as a USTA team later this year for 5.0 & Over Nationals. I had no idea what to expect when I agreed to play this event, and depending on who my teammates would be, the experience could have gone vastly different, I suppose. But these guys are all great. I'll be rooting for them all even when this team event is over. It's great to root for someone because you really want them to do well not just because you want your team to win. Anyway, we get one more crack at a really good team tomorrow and I couldn't ask for a better group of people to do it with. Go USA! 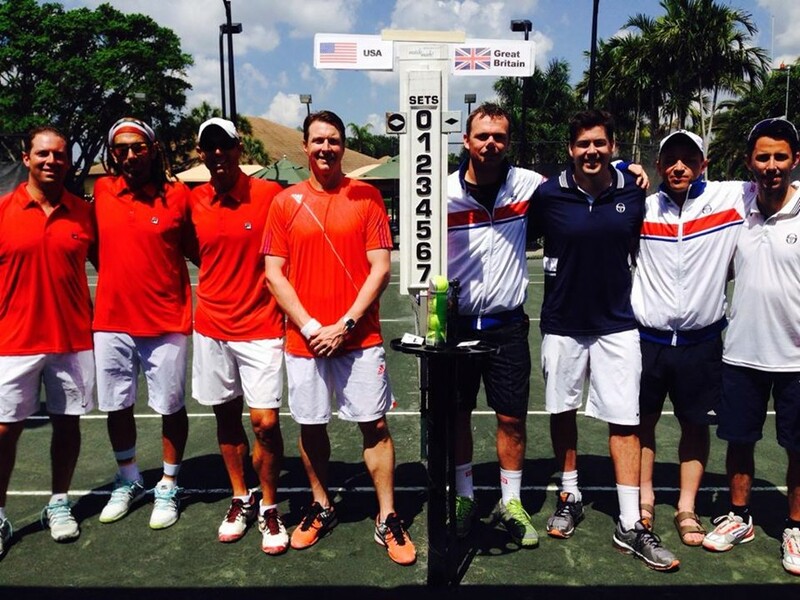 We lost 2-0 to Germany, and we did not bother to play the doubles, as the competition was ultimately decided for us. We finished sixth. I'll catch up with you guys and write a proper close tomorrow. We're all pretty bummed today. Afterthoughts. So first foray into international team competition is over and I'm already a bit nostalgic. It's been a great long week, but no rest for the weary here. The individual championships started this morning and I was on the court at 1030 am. Had to wake Otis (Mojo) up early enough to get breakfast and drive north to the site to register, and just barely made it to the site on time for my match. Seemed like 15min later I was down two breaks 5-2 and set points, but watching all the tennis this week, watching my teammates, I started thinking about how they were playing and winning singles points all week and channelled a bit of that. A nice comeback victory in straight sets gives me the opportunity to play the 8 seed tomorrow. I'm sure once this is over I'll take more time to reflect on the whole experience in more depth but it was an amazing event. The host sites, the coordinators, umpires, trainers. Players have badges and transportation schedules... It just feels like a Grand Slam here. And in good fashion the finals came down to Spain and France, and they split the singles, and then split the first two sets of the deciding doubles point. France went up 5-2 in the 3rd only to have Spain come back and bring it to a breaker. The crowd and the players were loud. There was a lot of intensity out there. And it's cool because a lot of these guys still make a living playing prize money events and club tournaments, but here it's all for country. Congratulations to Spainm they pulled it out, France got 2nd, and Great Britain (who we had a great match with) on their bronze medal performance. 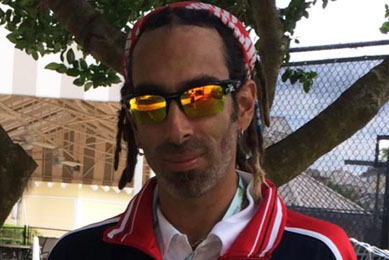 Thank for keeping up with Mojo and I on our little adventure here in Florida, and thanks of course to the USTA for selecting me to play. Was a big honor for me. This was a lot of fun, even the blog part. Also, it's pretty cool many of my friends and people I don't even know keep asking when the next day's post will be posted or tell me they are following it. That meant a lot to me you guys.